Do not remove found young or newborn kittens from their mother! Although most people think they are doing the right thing, newborn to four-week old kittens are better off with the mother cat to take care of them and the sad truth is that the majority do not survive if removed. 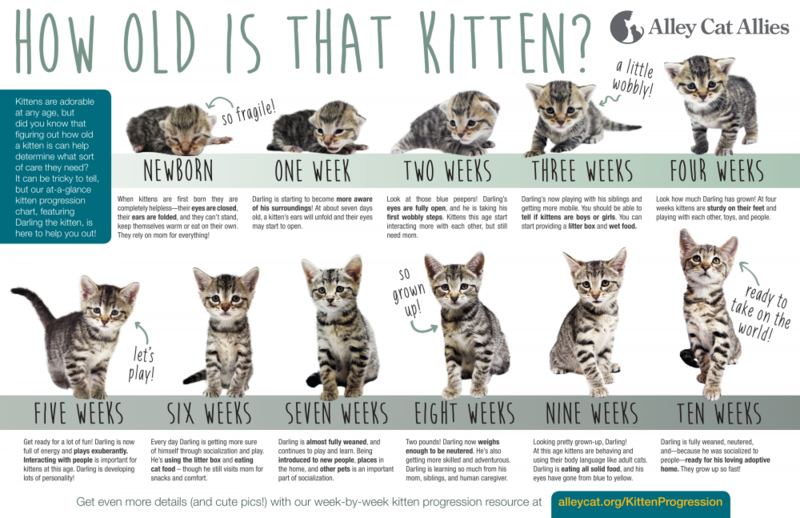 Kittens under four weeks of age must be bottle fed around the clock and local shelters and most rescues do not have the resources to take care of them. Rescues are better able to handle orphan kittens four weeks and older. If you find any stray kitten, leave it alone and check back every so often for three hours. Mother cats have to leave their kittens to hunt for food and will usually return within 3 hours. Sometimes the mother cat is moving their kittens and you might happen upon a kitten in that process. Remove kitten(s) only after three or more hours have passed and the mother cat has not returned or is nowhere in sight. If you cannot stay with the kittens to watch for the mother, scatter a ring of flour around the kittens. If the mother returns, you will see her paw prints in the flour. Contact your local animal control office to report the found pet and leave a detailed description. Pet owners will often report a missing pet to a municipal animal control office. Check with neighbors and place flyers around your neighborhood. Check lost and found pet websites such as pawboost.com, craigslist.com, https://www.facebook.com/Va.Lost.Found.Cats, petamberalert.com, and http://www.richmondgov.com/AnimalControl/LostAndFound.aspx, Local media sites such as nbc12.com also share information about found pets. Your veterinarian or local animal control office can scan the cat for a microchip. If the pet needs emergency veterinary attention, please take him to the nearest veterinary clinic or after hours to an 24 hour emergency veterinarian. If you are unable to locate the pet’s owner and are considering keeping the pet, you can do so after reporting the pet to Animal Control and holding him for a requisite stray period to give the owner an opportunity to claim him. Stray periods are usually around 10 days, but vary by locality. If you are unable to keep the pet, you may also contact your local animal control office or a pet rescue organization. Always ask about any organization’s euthanasia policies.